Not every furniture store has the honor of being the best Columbus Ohio Amish furniture store. That’s an honor and a privilege we don’t take lightly at Amish Originals Furniture Co. Aside from having been in business since 1992, we also have worked hard to take care of our customers, and it shows. Located in beautiful historic Uptown Westerville, Ohio we work closely with more than 70 families in the Amish communities in and around Northern Ohio. 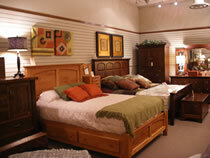 We’re a top choice for furniture because we have great selections for every room of your home. This includes kids rooms, home office, home theater and even your outdoor seating area. All pieces are built to your specifications once you place your order. Not only does this mean you truly get unique furniture but each piece is completely handmade using time honored traditions from Amish craftsmanship. Only the finest American, kiln-dried hardwoods are used for your pieces. This means they not only look stunning but are meant to withstand the test of time and become family heirlooms to pass down for generations to come. The customer service care you receive actually shows how important our customers are to us. Whether you only need help placing your order or need assistance deciding on what would work best in your home, our expert staff is willing, ready and able to help. You can feel good about shopping at Amish Originals Furniture Co. because it means going “green.” The process used to build the pieces, the use of all scraps left over and even the loading and transporting steps all follow environmentally sound procedures. So you can feel good about supporting our business and bringing these items into your home. There are plenty more reasons we’ve become the destination shopping spot for Amish furniture in Ohio. This, however, should begin to give you an idea of why so many people are already shopping with us. Residents and visitors trust in us as the Columbus Ohio Amish furniture store to choose. Just because we opened our doors about 20 years ago doesn’t mean that’s when we really started. In fact, the roots of our approach to customer service date all the way back to 1925. That was truly the first generation of what was to become our business today. Back then customer service really meant something and a handshake sealed the deal. We still stand by this honorable tradition that has withstood the test of time, at least in our store. It means listening to the customer and doing what it takes to make their experience a good one. It’s about finding out what being the number one Amish furniture store Columbus Ohio really is all about. Come see for yourself.